I haven’t done a blog hop in years, but Sarah talked me into joining up with this one that she is hosting! We honestly didn’t do an Easter basket for Stella for her first 2 Easters (at 3 months and 15 months old, I just didn’t think it was worth the effort), but this year she is 2 yrs 4 months old, and she is DEFINITELY into the whole idea of searching for eggs with little gifts in them. 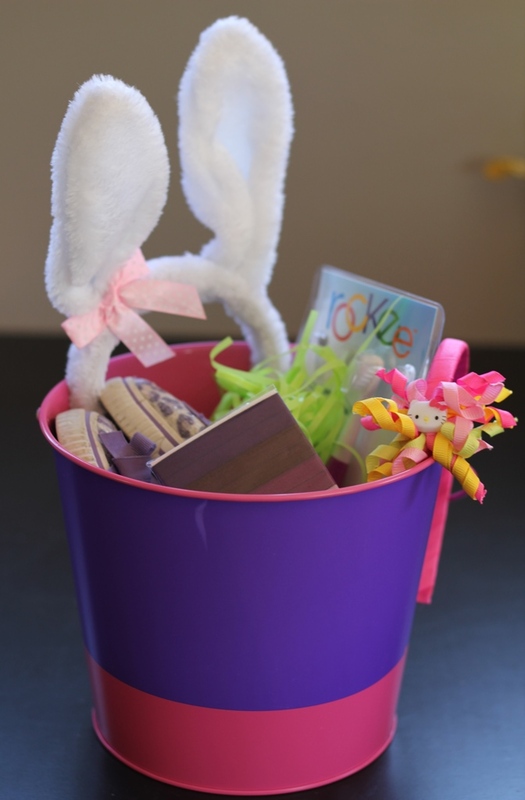 I am not a Pinterest mom or a gift-giving mom in the slightest, but I DO have fond memories of my Easter basket as a kid, so I figured it’s the least I could do for my own offspring. Without further ado, here is what I’ve thrown together for her basket this year. Please keep in mind that Stella is currently OBSESSED with anything purple & Hello Kitty (groan). Circo girls’ shoes: $15 (Target) – She saw me buying these last weekend, insisted on wearing them out of the store, and has rarely taken them off since (hence why they are already dirty and worn). So much for an Easter surprise! 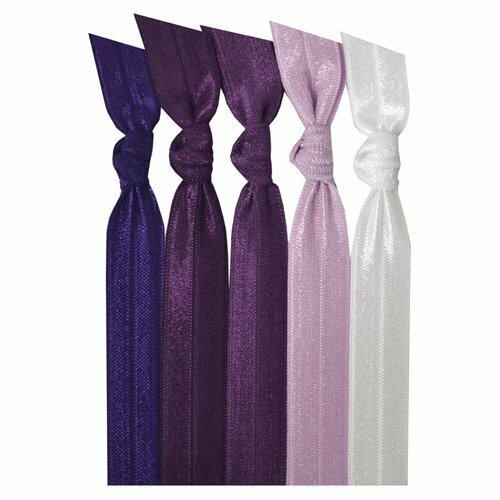 Emi-Jay hair ties: $11 (Amazon) – Stella’s hair is finally getting long enough to pull back with ease, and these can double as wrist bands when not in her hair, so I’m guessing she will love them. How about you? Are you doing an Easter basket for your kid(s) this year? Visiting from the link up. Love that toothbrush! So unique! Glad I convinced you to join in the fun! 🙂 Those hair ties seem to be all the rage for toddler girls so you’ll have to let me know if you like them and if I need some for in the future with baby girl. Can’t wait to see pics from the backyard hunt! religious kid book. It makes me kind of sad not to give them more than that, but they get sooooo much other stuff that it just gets to be overboard. Maybe someday I’ll tell everyone else they can give them one thing each, and I get to give them the big basket. Idk, we’ll see. Sheesh. THIS literally just reminded me why I didn’t do baskets the last two years. My (loving) MIL gave her baskets – MUCH TO MY FRUSTRATION – because apparently it hadn’t occurred to her that I’d want to do something like that. Hm. I’d better get on the phone to her that “I” am making a basket this year. I like the religious book idea too! We will do church, but i hadn’t thought about a book. Hello! I am Meg, I am stopping by from the linkup! My Ellie is really into Hello Kitty right now too! She is getting a Hello Kitty basket and Hello Kitty socks. We also got her the same bunny ears! They’re so cute! Have a great day! I’m sure Stella is going to love her purple filled basket. I think Savannah is getting the same Hello Kitty bow. Easter egg hunts are always so much fun. Stella is go I g to really love it. Oh that’s really interesting. We don’t do baskets like that. I’ve got Molly an Easter egg and new winter pjs! My daughter is 10 weeks older than Stella and we haven’t done anything easter related for her in the past, probably because like others said the grandparents go nuts. My mom gives clothes and a toy and just a bit of candy which I can tolerate, but my MIL gives literally a huge bucket of candy and annoying dollar store toys that just fall apart. We don’t eat much sugar or grains in my house, so I have issues with large amounts of candy. As for what we are doing, we will take her to the little town closest to us for an egg hunt on Saturday, then will hide eggs for her on Sunday to find. Probably hide some dum-dum suckers in those. We don’t believe in excessive gift giving for any holiday so she will probably get a set of clothes like a shirt/shorts combo and a book about rabbits. Ohh purple.. that is Lids FAVOURITE colour too! Purple everything!! We have 4 kids 5 and under so we will do small baskets with something they really would like (like a playmobil small toy or doll), a book, a few small candies. My husband’s parents send money for Easter (they live out of the country and can’t make it this year as my FIL is ill) and my side visited last weekend for my son’s birthday (actual bday right before Easter) and brought Easter gifts for the kids. We also bless baskets of certain foods (a Polish and Slavic tradition) with our kids on Saturday and eat that food after church on Sunday. My husband and I grew up with this tradition so I love doing it with our kids! Plus a Easter egg hunt Sat which should be fun! I love the shoes how cute! I mostly get everything I would have gotten her too! Stuff for spring or summer playing since her birthday is in September! Happy Easter!